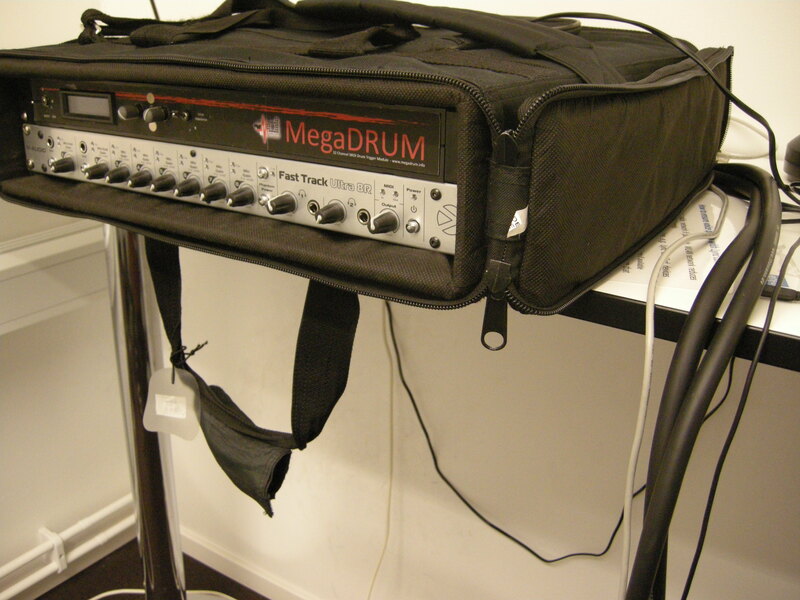 I have found a nice way to handle the all the cables connected to my rack mounted MegaDRUM-32 (16 stereo inputs) and M-Audio FastTrack Ultra 8 R sound card (8 outputs). So I bought two 5 meters of 8 channel multi cables from Thomann with stereo tele-plugs + 1x 3m 8 channel multi cable XLR to XLR for the balanced audio outputs. Some of the trigger inputs needed a 90 degree tele-plugs (e.g. to fit the Roland cymbals)…so I changed these standard tele-plugs on the multi cable to a 90 degree version. The idea by using two multi cables for the trigger inputs is to split up the cabling…these cables are going to each side of the drums which makes it look nice and tidy. I am letting the solid cable to just drop from the trigger pad to the floor. A more permanent solution would of course be to use straps on the hardware. 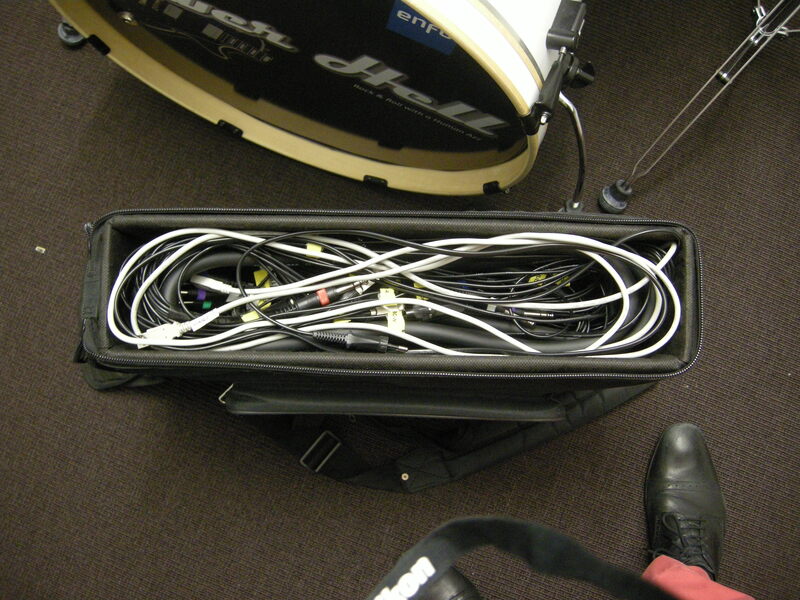 I am moving my “drumbrain” quite often…so I have mounted the all the gears in a 19″ inch, 2 units high rack suite case…and the fine thing in the end was that all the cabling did fit in the rear of the suite case when transporting the whole thing! 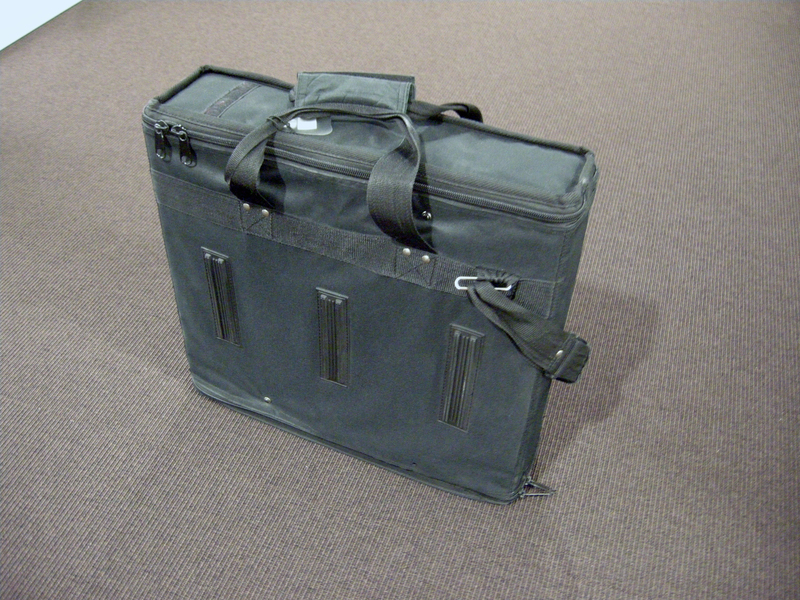 The rack is 41 cm deep so there is plenty of space in the rear for cabling.